A man has generated heated debate online after he posted comments questioning why McDonald's allowed the Muslim prayers to be played at one of its restaurants. The debate first started after a man known as Alex Chang posted his comments on the McDonald's Facebook wall on Thursday. He had asked why the fast food giant's outlets are playing the Muslim prayers during dinner time at its restaurants. 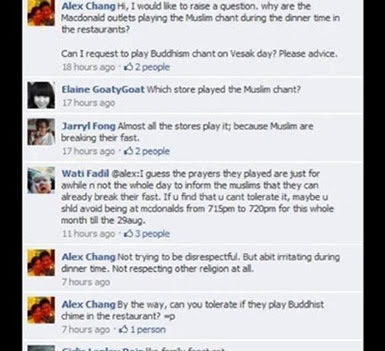 "Can I request to play Buddhism chant on Vesak Day? Please advice," he asked sarcastically. While he was identified as a SingTel employee, it was uncertain how this came to light. 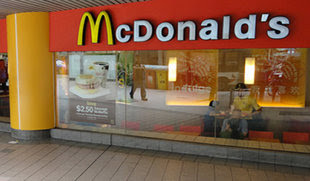 Chang also did not state the McDonald's outlet which he was referring to. SingTel could not be reached when contacted by Yahoo! Singapore. His remarks on the issue drew a few comments explaining that the reason could be Muslims are breaking their fast. In response, Chang said, "Not trying to be disrespectful. But a bit irritating during dinner time. Not respecting other religion(s) at all." "By the way, can you tolerate if they play Buddhist chime in the restaurant?" he added. Posting a statement on its Facebook page on Friday, the fast food chain stressed that it respects all races and religions equally, adding that it had to remove some posts from its wall. "We hope everyone understands that we've had to remove a number of wall posts on our page. We encourage all our Facebook fans to be respectful to one another," it said. Two hours after McDonald's posted the statement, Chang issued an apology for his comments, saying that it was not meant to be "racist". "I would like to apologise for the comment that was posted on the McDonald's website. It was not meant to be a racist remark which has offended so many people including our Malay friends. Sorry for my ignorance," he said. Meanwhile in a separate statement on its Facebook page, SingTel emphasised that it is an "equal opportunity employer" and has a diverse and multicultural workforce. "We have clear company values and guidelines and do not tolerate discrimination. We expect our employees to be personally responsible for the content of their personal posts online. "We are disappointed that an employee recently posted comments that were seen to be inappropriate and we are counselling him," it said. Actually isu ni kat Singapore, no wonder la. Kat sana memang racist sket bab-bab macam ni. Bukan nak cakap apa, tapi so far kat Malaysia ok je kan. Lupakan dulu isu pasal da Indian guy yang complaint azan kat kawasan perumahan dia. Kita juz amek yang positive. Chinese kat Malaysia ni still lagi ble respect dengan agama kita. Siap ada yang join untuk berpuasa sekali, even at da same time still hev a few Malay Muslim yang PONTENG puasa (huhh abaikan, itu hal dia dengan ALLAH SWT). Boss Honey and most of my colleague pun Chinese, ok jer, peramah dan mesra gittewww... Kalau baca komen-komen kat Yahoo ni, ramai jer puak-puak dorang yang tidak menyokong tindakan si Alex Chang tu. It means, only 1/1000 hev dat kind of yuccckkkksss behaviour. Apa Kata Honey: Terlajak perahu masih boleh diundur lagi, terlajak tulih kat facebook jadi artislah!! dah agak dah mesti kes kat Singapore punya. Mula mula baca, rasa dalam hati ni mesti hantu kat cina nih. Walaweyh, tepat pulak. Well, actually benda ni nothing. Tapi saja nak api api la tuh. kat sini pun lebih kurang je.. isu cakap azan subuh bising pun ada... cuma tak brani nak lebih2 je.. diorng ni kadang bg betis nak peha.. silap hari ada yg kena libas..
racist tak kena tempat.bulan puasa stahun sekali jer weyh!! !klu aku pegi singapore siaplah ko!! U silap bila cakap macam tu.. konsep Habluminallah... tu pasal menjaga hubungan kita dgn Allah dan manusia..
Tp pasal sesama kita buat silap WAJIB kita tegur..